WOW, here's another simple and quick card. I wished I would have either chosen words with a thicker font or made the oval smaller. But I was working on making a quick card and didn't know how the words would look until after it was assembled. It's okay in the word area but I really like the rest of the card a lot. So are you ready to hear how to make this simple card? The base of the card is a folded half-sheet of Whisper White. The Basic Black piece was cut 3-3/4" x 5". It was textured using the new "Garden Trellis" embossing folder. The words are from the "You're Inspiring" set. 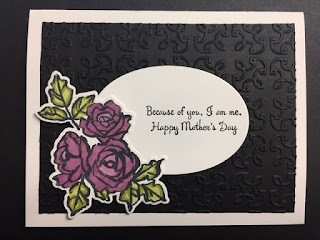 I thought I would make it into a Mother's Day card since I have a large supply of Birthday cards. I colored the flowers using Blends markers, Old Olive and Rich Razzleberry. I was going to go with Real Red, but it's so traditional! I centered the oval and set it in place using Dimensionals. I used Dimensionals on the outer part of the flower and the part that sits on the oval has snail tape under it. And that was it!! I thought it was fun and I plan to make another one but I'm going to use maybe just a "Happy Birthday" even though I don't need one because I have some that have a thicker and larger font that would look better in that oval. But all in all I do like this card.